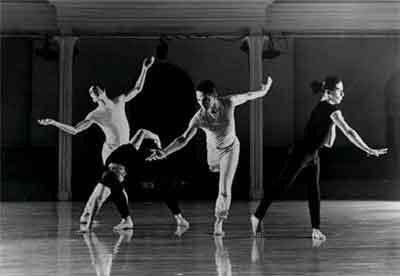 Paul Langland and Brendan McCall's Almost Rapture, with [ L to R ] Scott Heron, Wendell Beavers, Brendan McCall and Pablo Beracochea. February, 1997, Danspace, NYC. Brendan: I've heard you say that "technique" is inaccurate to describe this work. What do you mean by that? Allan hated the word "technique." He said, "Whatever you do, never call my work 'technique'." I believe his quarrel with this word was that it implied a closed-ended system of rules to learn specific moves. His commitment was to facilitate an individual's ability to grasp a clear and expanded use of the body, finding fresh physical discoveries based on experiential exercises and functionally-based improvisations. Out of respect for him I currently call this body of teaching "Allan Wayne Work." I'm not sure that's the final phase. While I know what his argument with the word "technique" was, I feel less concerned about this issue. I mean, why can't technique include creativity, open-endedness, and personal discovery? Brendan: Let's talk more about the work itself. Could you briefly describe Allan's classes, some of the exercises, and what they do? Allan was a very intuitive teacher.He seemingly didn't structure his classes. He would start class informally, working with us on individualized alignment and physical exercises. The atmosphere of the class was free-wheeling, anarchistic, and intense. One of Allan's ambitions was to combine the personal vision of modern dance, the experiential nature of Eastern Yoga, and the alighment and placement of ballet. This issue was very vital in the 1920s and 1930s, and the early days of modern dance. Combining these approaches is something that, as performers and teachers, we are still working with in contemporary dance today. Through his unique synthesis of diverse disciplines, Allan developed a way to experience the inner body in movement. He did this by going beneath outer layers of musculature and isolating a subtle and poetic use of muscles "closer to the bone," a phrase he used frequently. Consistent results include: the releasing of chronic tension in the superficial muscles, rehabilitating deep postural muscles that aren't used efficiently, increased power and ease of movement, and an inner experience of balance and integration. From the outside, the movement which results is beautiful.